Wordless Wednesday: Home raised, handspun, hand (loom) knit, done! Pattern here. More wordless here and here. 1. Dancing to the music of laughter while visiting with my friends makes me happy. 2. The last time I doubted myself I nearly gave up, but I persevered and everything came out just right. 3. When I drive I love to sing to songs on the radio. 4. I saw our beautiful alpaca Samson standing out in our pasture this morning and I couldn't get over how handsome he is. 5. Give me fiber, give me a drop spindle, give me yarn. 6. Next week I am looking forward to working in the Alpacas of MN State Fair Booth, promoting alpacas and the Alpacas of MN Farm Tour, hope to see you there! 7. And as for the weekend, tonight I’m looking forward to creating paper mache manaquin parts to display my alpaca garments, tomorrow my plans include creating more manaquin parts and Sunday, I want to visit with my sister who is recovering from surgery! Wordless Wednesday - I finally got around to designing a logo for our alpaca business! We raise alpacas and when we shear our alpacas I say it is time to give the alpacas a haircut. Once the "hair" is off of the animal I call it fleece. I work with this fleece in many different ways such as spin it into yarn and make felt out of it (for slippers, mittens, rugs, etc.). My youngest daughter knows I call it fleece, and she apparently picked up on me saying we give them a "haircut". Well, I gave my five year old a haircut and threw the hair in the garbage in the bathroom. My two year old went potty and spotted the hair in the garbage. She yelled from the bathroom to me, "Mommy, is that Paige's fleece?" Hee, hee! So excited, I got my Hatshaper today! I can't wait to make a wet felted cowboy hat out of my alpaca! I can see a knit and beaded band around the brim. Just had to share, I am so excited! I know, I am easily amused. She made me do it, I just had to post something on my blog today! A while back Denise had a shout out for suggestions on things to write about on her very cool, and always educational How-To's Tuesday. I had some things I was interested in learning more about so I gave her a suggestion or two, such as How To Pick a Good Substitution Yarn. 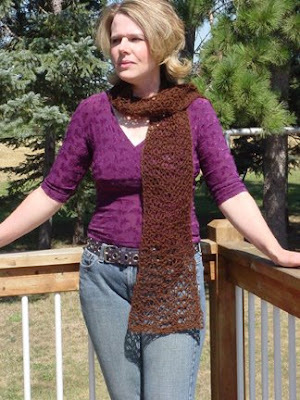 This is a great one if you have an allergy to the yarn used in the pattern or you have a gorgeous yarn in your stash and you would love to use it. She offered up a link to a website with a database of yarns that make a no-brainer of picking out a suitable yarn substitute for your project. I have to say though, the How-To's Day post I learned the most from and have put to use the most lately is How to Measure Your Mystery Yarn and her post How to Figure out the Weight of Your Mystery Yarn. Since I've become obsessed with spinning, I have a lot of yarn I need measuring! I of course don't have the benefit of a label, I have to do all the work myself in order to figure out how much of each skein I have. To me, this How To's Day post is priceless! Now, to make her How-To's day even better, she dreamed up a sweet contest! Go ahead and hop on over there and look through her previous Ho-To's, leave her a comment about your favorite one in her contest post and you just might win yourself a $25 gift card to JoAnn Fabric! How cool is that? 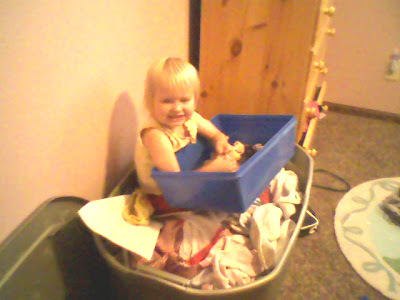 Wordless Wednesday - Oh, Amanda, where are you? Oh, there you are, in storage! 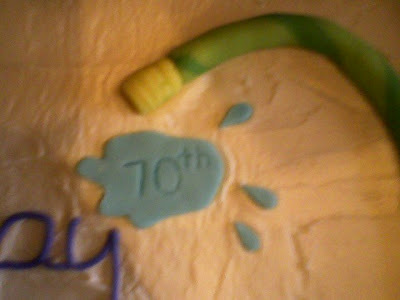 On Friday I mentioned I was designing a birthday cake for my mother-in-law's birthday party today. It turned out just darling and I wanted to share some pics with you! 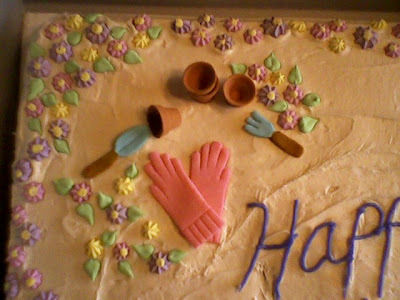 My mother-in-law loves gardening and flowers so I decided to go for a garden themed birthday cake. 1. If I could travel back in time, I'd go to when I was just a little girl and watch my grandmother knit and crochet and try and bring back some of that information to today so I can become better at these two things. 2. Give me sleep or give me coffee (sorry, I only got 2 1/2 hours of sleep last night). 3. I am listening to my two year old singing. 4. Somewhere, someone is thinking does this woman ever post anything other than Friday Fill Ins and Wordless Wednesday? Well, yes, I do! As soon as five of my six kiddos are back in school, I'll be able to post pics of all my creations and I will be able to write all about my creative endeavours. 5. I'll always be creating something until the day I die. 6. My idea of a good time includes peace and quiet! (I must be getting old). 7. 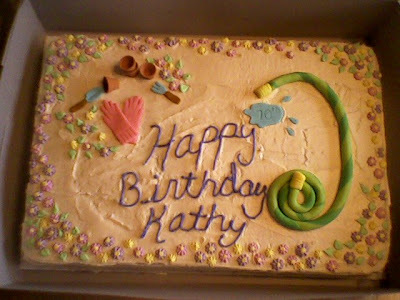 And as for the weekend, tonight I’m looking forward to baking and decorating the birthday cake I designed for my mother-in-law, tomorrow my plans include attending the Alpacas of MN meeting I was responsible for organizing and Sunday, I want am going to the birthday party that above said cake was made for!